I enjoy cooking, a lot. I guess, my mom was an inspiration in that. She is an amazing cook and everything that comes from her kitchen is incredible. I have learned a lot from her over the years, but have since also added a few of my own tricks and twists. The inspiration for this dish came from a Pappardelle wide cut pasta, braised pork sugo from Tomasso Tratoria in Southborough, MA. 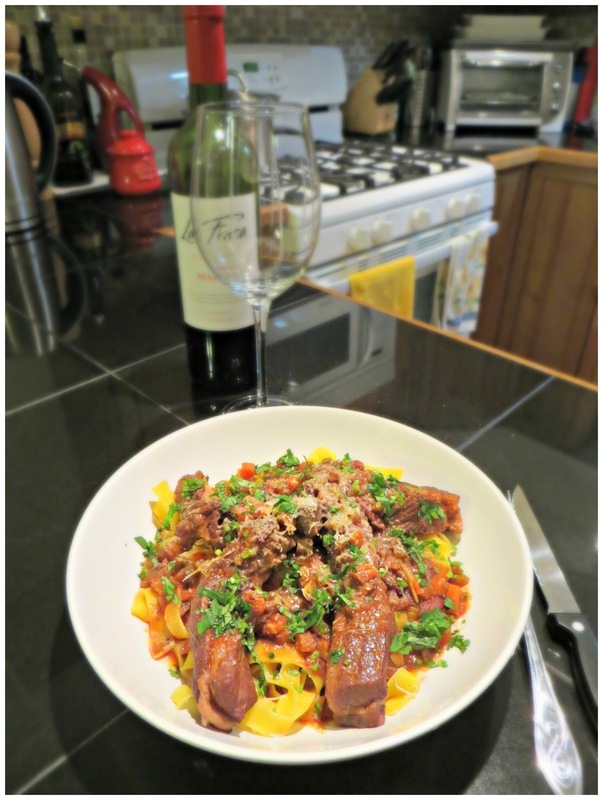 It was an incredible, melt in your mouth braised meat in rich sauce, with a compliment of pasta. 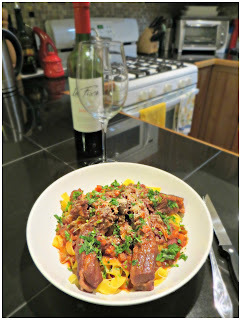 So, here’s my take on the dish – hubby and I approved! Preheat oven to 325 degrees F. Add diced bacon to the Dutch oven (or large oven-proof pot) over medium heat and cook until it begins to render fat and brown. Remove the bacon from the pot and reserve for later, leaving the fat. Season the ribs and begin to brown. Do this in batches, so the pot does not get crowded. Let the meat sear and develop a nice crust. You want to develop a layer of caramelized meat juices, but if it gets too dark it will tend to be bitter, so keep an eye on it. Once the ribs are browned, add your mirepoix of carrots, celery and onions; a tablespoon of extra virgin olive oil, salt and pepper. Scraping up the brown bits on the bottom of the pot, let the vegetable get some color, then add wine and reduce by half. Add the bay leaves, thyme, rosemary, garlic, tomatoes and chicken stock. Add reserved bacon and ribs back in the pot, give it a good stir, cover and slip it in the oven for about 2 hours, or until meat is very tender. Remove the bay leaves, thyme, and rosemary. If the sauce seems fatty, let it rest a few minutes then spoon off some of the fat before serving. You can pull the ribs from the pot, remove the bones, and gently pull the meat apart or serve them on the bone. Also, if you like a smooth sauce for serving, you can put the sauce through a food mill then add the meat back to the pot. While the ribs are cooking in the oven (in the last 20 minutes or so), cook the pasta according to package directions. Drain and serve with ribs and sauce, garnish with parsley and grated cheese.